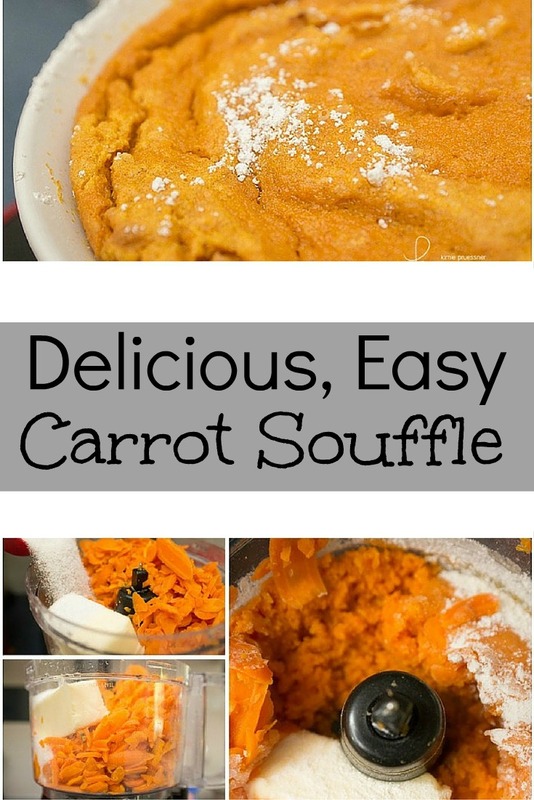 Today I’d like to introduce you to Kimie Pruessner, who will be sharing a delicious carrot souffle recipe that’s great for fall. Thank you, Laura, for having me on the blog today! I’m a Dallas newborn photographer, but FIRST I’m a mom of 3 little ones (almost four little ones!) and am always on the lookout for delicious recipes. THIS is one such recipe, and it’s perfect for the fall. It tastes like the holidays (adapted from AllRecipes), and my kids gobble it up every time I make it. Enjoy! Here is the cast of characters: baby carrots, butter, vanilla, flour, sugar, baking powder, pumpkin pie spice, eggs, and powdered sugar. All measurements are summarized at the end of this post. 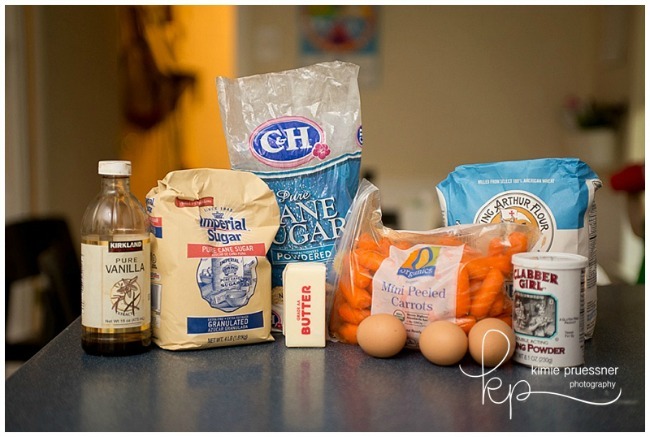 The two pound bag of peeled baby carrots you can buy at most grocery stores saves you SO much time in this recipe. 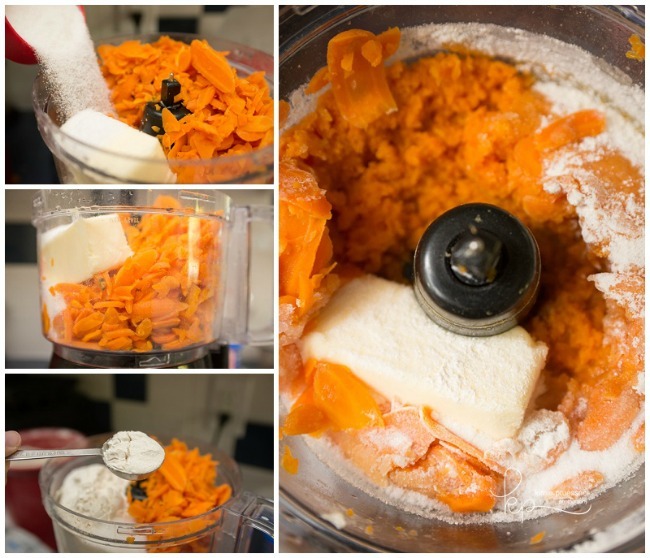 Just chop up the carrots (I use a food processor) and boil them for 20 minutes, until they’re nice and soft. The beautiful thing about making this recipe in the food processor (you could also use a stand or hand mixer) is there’s almost no mess. Everything gets measured and added to the container, and then just pulse until it’s combined. 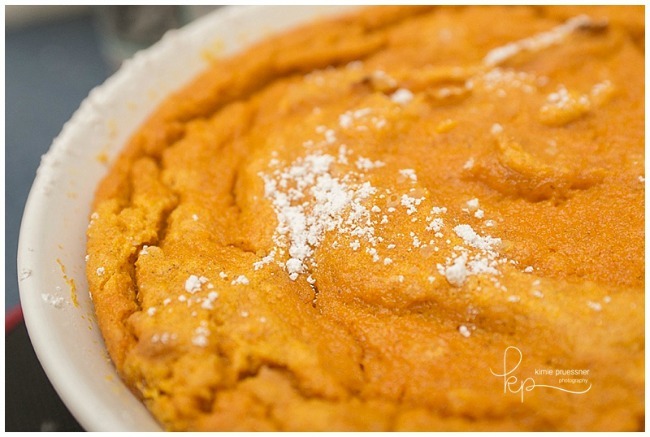 Specifically — add a stick of butter (1/2 cup), 3/4 cup of sugar, 3 Tbs flour, 1 tsp baking powder, 1 tsp vanilla extract, and 1 tsp of pumpkin pie spice to the food processor and pulse to combine. Beat the 3 eggs and add them in through the top of the food processor while it’s working. I add the eggs last so that the carrots have cooled down a smidge and you don’t end up with ribbons of cooked egg in your souffle. Pour the mixture into a 9″ pie pan or shallow casserole dish, sprinkle the powdered sugar over the top, and pop it in a 350 F oven for 45 minutes. And you’re done! Enjoy this warm, sweet, holiday carrot treat alongside your favorite roast beef or a rotisserie chicken from the grocery store. 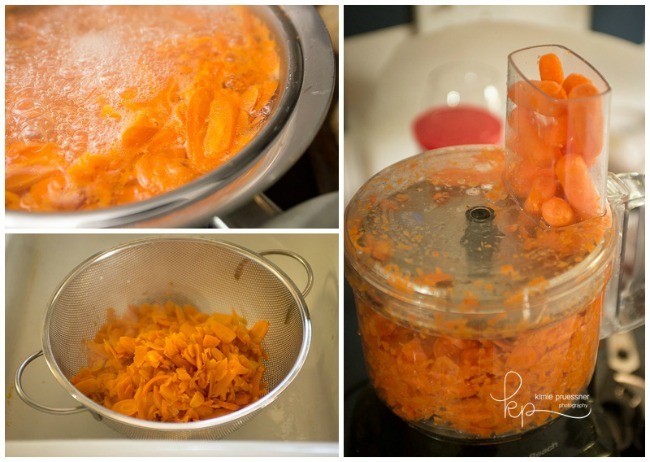 Chop and boil carrots until soft, about 20 minutes. Drain and mash or in a mixer or food processor. 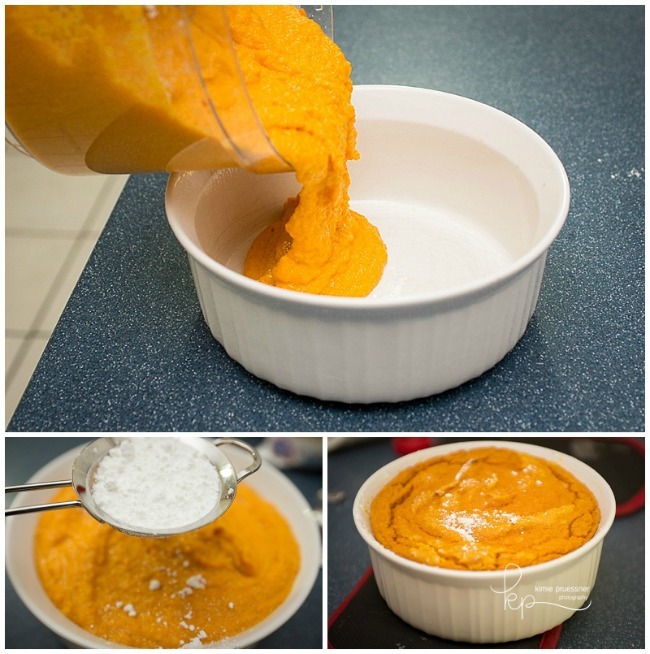 To the carrots add softened butter, white sugar, flour, baking powder, pumpkin pie spice, vanilla extract, and eggs. Pulse or mix well to combine. Transfer to a 2 quart casserole dish or a 9" pie pan. Sprinkle with confectioners' sugar. Bake in preheated oven for 45 minutes, until just set. Kimie Pruessner is a studio and natural light newborn and family photographer in Richardson, Texas. She stays home with her three kids, ages 4 and under, and keeps her sanity by cooking, blogging, exercising, and playing piano. Like many Texans, she is a lover of Colorado, the mountains, and snow. But family is in Texas, so Texas is where she’ll stay! This sounds really amazing! I am pinning it and plan to give it a try soon.